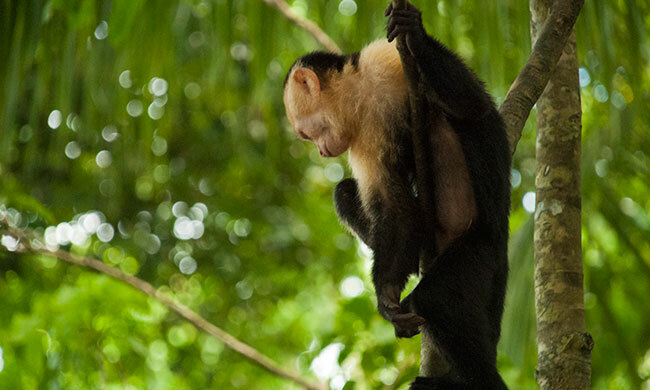 Enjoy Manuel Antonio and Arenal in One Amazing Family Package. Families who want to experience the best of Costa Rica and go on adventure tours. Costa Rica comes to life during the green season, when all the flowers begin to bloom and migratory animals make the country their home for a few months. What better time to have a Costa Rica family getaway? You can count on some rain, but the temperature is warm and you can be sure to see the sun for most of the day. Those afternoon and evening storms make for cozy evenings in the hammock but often it clears up in time to see the sunset. Begin your exciting Costa Rica vacation by visiting the lush region of Arenal where you can spend the days hiking, going on canopy tours, or visiting the hot springs. 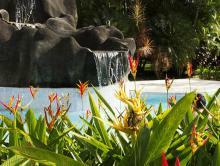 Your hotel here in Arenal is the Manoa, a family-run property that offers great service and comfy accommodations. Be sure to take a trip to see the vast Arenal Lake and maybe even take a kayak trip across its famous waters. From Arenal, you then travel to Manuel Antonio, one of the country’s most famous beach destinations and a firm favorite among families. The world famous national park is home to a huge array of animals, and you are almost guaranteed to see a monkey or 10! The road to the beach and park entrance is lined with hotels and restaurants—you can eat world-class cuisine or just sip a cocktail looking out over the bay and islands. What’s included in ‘Monkey Trails and Waterfalls’? 3 nights at Lomas del Volcan—Breakfast included. 3 nights at Si Como No—Breakfast included. Private shuttle service from the San Jose International Airport to Lomas del Volcan. Round ground transfer from Lomas del Volcan to La Fortuna waterfall. Shared ground transfer from Lomas del Volcan to Si Como No. Round ground transfer from Si Como No to Manuel Antonio National Park. Round ground transfer from Si Como No for the full day of waterfalls tour. Private shuttle service from Si Como No to the San Jose International Airport. A full day of waterfalls tour in the Pacific. Welcome to San José! One of our representatives shows you to a ground transfer that takes you to the town of La Fortuna by the Arenal Volcano. There you will stay at the lovely Lomas del Volcan, which is so close to Arenal Volcano you feel you could touch it. You and your family can take part in countless tours including sky tram, canopy tours, hikes, horseback riding, and visits to the various hot springs in the area. 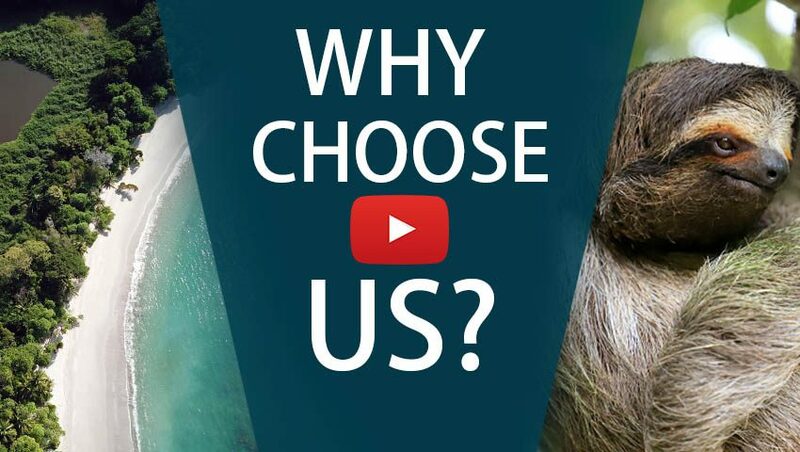 Simply ask us or your hotel and book one of them. If you prefer to rest, make sure to enjoy all the amenities at Lomas del Volcan as well—spending days relaxing in your room, walking among the lush gardens, exploring the hiking trails, or sipping a refreshing drink by the pool. 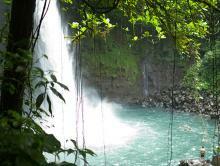 Visit La Fortuna Waterfall, found at the base of Cerro Chato. Cross the rainforest and go down a staircase to the 210-feet waterfall. Swim in the refreshing water or relax in the natural pools created by the Tenorio river. The canyon around you is full of verdant vegetation and wildlife, so keep your eyes open and be ready to snap a photo. Take a shared ground transfer to Manuel Antonio where you stay at the Si Como No Resort & Spa, a boutique hotel perfect for families. Enjoy your stay by visiting their private wildlife refuge, relaxing at the spa, enjoying a movie in the hotel’s private theater, or setting out to visit the beaches of Manuel Antonio. Known for its stunning natural beauty and the ideal combination of beach and jungle, Manuel Antonio National Park is a must during this vacation! 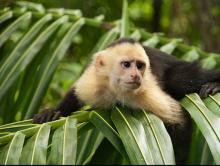 Manuel Antonio is Costa Rica’s smallest national park and one not to be missed. It has both beaches and rainforest, populated by a wide variety of flora and fauna. A guide takes you in a hike across the terrain while he or she points out animals and trees and explains their characteristics. Keep your eyes open: orchids, sloths and toucans are just some of the sights! It’s time to go after more waterfalls. This tour takes you in a full day of exploration off-the-beaten-path. Hop on a van and drive around the Central and South Pacific to hidden waterfalls across the area. Discover nature and experience fresh natural pools and slides. Top it off with a delicious lunch and a stop by a secluded beach with amazing rock formations. This trip has something for everyone, so be sure not to miss it. Your personal driver picks you up to be taken back to San José where you will catch your flight back home.